If your brand is worse off or less valuable than a business that is forbidden to promote its brand, that speaks volumes for the position you're currently in. 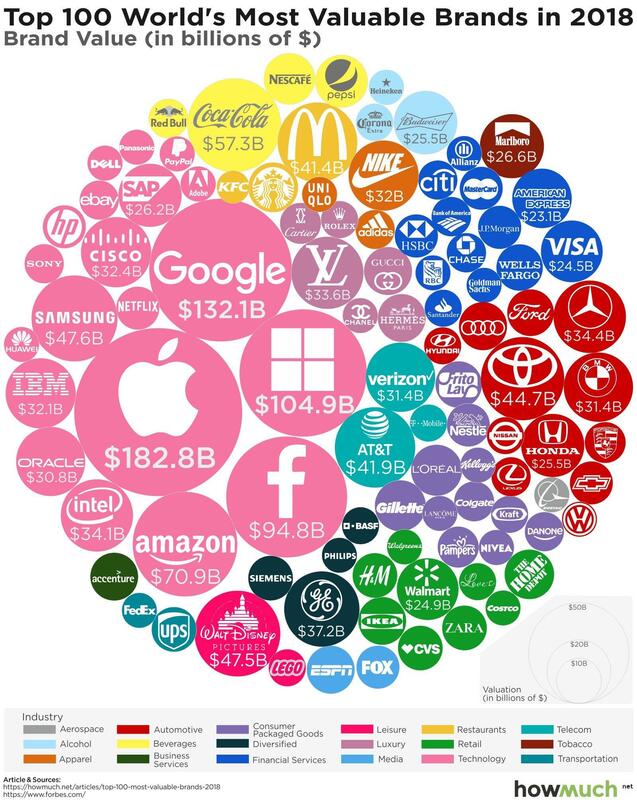 Skimming through my usual news feeds on LinkedIn I came across an infographic that illustrates the relative size and value of the brands of companies all around the world. All the typical companies were there at the center, with the most valuable brands and companies like Google, Amazon, Facebook and Apple, brands that have come to basically dominate consumer households and lives. But there was something that surprised me as I looked through the second and third tier of brands in the market. You would think banks would be one of the most important and trusted brands, due to their roles in our society, that these institutions would be prominent with a high brand value. I was surprised to see that the brand value of the major banks like HSBC and Santander were actually smaller than that of Marlboro. Now Marlboro is actually forbidden from promoting its brand or smoking in many markets. Sports globally have banned the advertising of cigarettes and smoking within the sporting profession. So you have basically got a brand that's been ostracised from the world, who have been told they are evil, who cannot promote their brand and yet they are still worth more as a brand than the world's major banks. And what does that say about the banking sector in terms of the brand equity they actually carry within them? We already know that the NPS or net promoter score for brands in the financial services sector is quite negative, particularly banks and insurance companies, very few of their customers have a positive perception of the brand. But this illustration shows just how bad it is in relative terms when you compare it to the likes of Marlboro. If your brand is worse off or less valuable than a business that is forbidden to promote its brand, that speaks volumes for the position you're currently in.